The mayor of Hebron, Taysir Abu Sneina, held the Israeli army responsible for the death of two children, who died in a fire in their home, in the southern West Bank city of Hebron, after the military delayed Palestinian fire trucks and Red Crescent ambulances, at two roadblocks in the city. 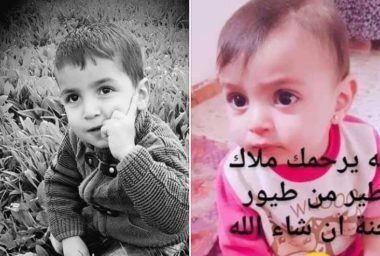 Spokesperson of the Palestinian Police in the occupied West Bank, Lieutenant Luay Zreiqat, said a child, identified as Wa’el Rajabi, four years old, and his infant sister, Malak, 18 months of age, died in the fire. Lieutenant Zreiqat added that a third brother of the two deceased siblings suffered serious burns and remains in a critical condition. The house is in an area that is under full Israeli control and separated by the rest of the occupied city by many military roadblocks. Hebron Fire Chief, Ayman Nassereddin, said that the fire department received a call at 10:35 on Tuesday at night, regarding a fire at the Palestinian house, in the Old City of Hebron. Nassereddin added that the fire trucks, and ambulances, were instantly dispatched to the scene, but the soldiers stopped them on two different military roadblocks; one is called 160, and the other is Ja’abra roadblock. 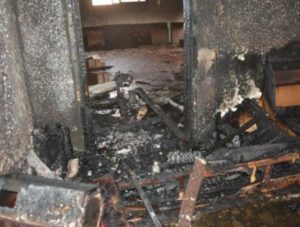 He also stated that the Palestinian District Coordination Office contacted the Israeli counterpart, and it took at least twenty minutes for the fire trucks and the ambulances to be allowed through. The rescue team managed to control the fire before it spread to surrounding homes.